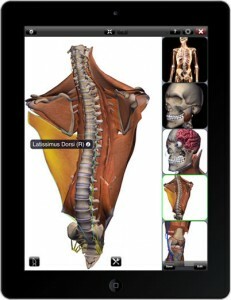 Explore the human body’s anatomy through an interactive app. Investigate over 4,000 anatomical parts. Build your own virtual specimens. Highlight, apply transparency, or create a cool x-ray look. Dissect any part or combination of parts to gain a look inside, peel away tissue and structures, or reveal separate layers. Save your specimens and build your personal library of your favourite anatomical views. 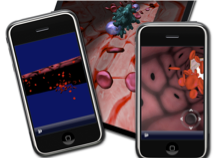 Check out more information on the Zygote 3D Anatomy Atlas & Dissection Lab, an app for iPad, iPhone and iPod touch available on the iTunes App Store. We have created this app in collaboration with our industry partners Zygote Media Group and The Lindsay Project Corp.
See our Anatomy Resources page for more details. We have built a remote control application for iPad, iPhone and iPod touch devices. Moving a single finger across the touch interface relocates the virtual human in its x−y-plane. Moving two fingers apart or close to each other will increase or decrease the zoom level, respectively. Rotating the iPhone/iPod around its central and lateral axis will make the virtual human turn accordingly. A vertical two-finger swipe moves a customizable cutting surface in and out of the virtual body, which allows one, for example, to see through the ribs, skin and muscles into the inside of the heart. This combination of touch gestures and rotation makes the iPad/iPhone/iPod an intuitive remote control device for instructors, who do then not need to use the keyboard or mouse for navigation of and around the virtual human.